Hanoi (VNA) – Prison sentences ranging from 4-9 years have been proposed for two ex-leaders of the Vietnam-Russia oil and gas joint venture Vietsovpetro for “abusing position and power to appropriate assets”. The punishments were proposed at the first-instance trial held by the Hanoi People’s Court on March 21. 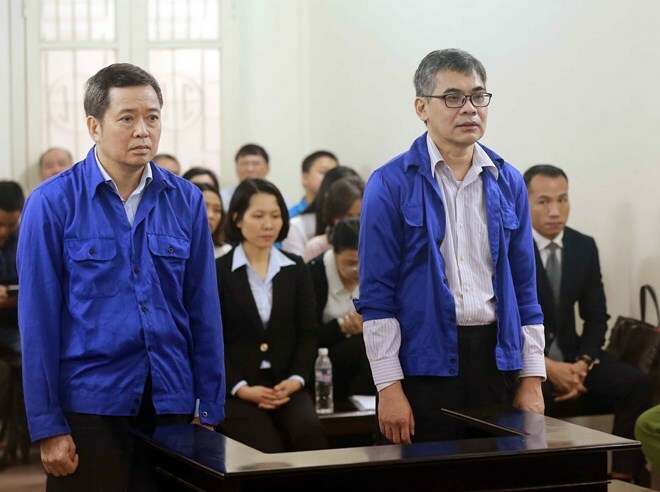 Accordingly, the Supreme People’s Procuracy suggested a sentence of 8-9 years in prison for Vo Quang Huy (born in 1961, former Chief Accountant of Vietsovpetro) and 4-5 years in prison for Tu Thanh Nghia (born in 1962, former General Director of Vietsovpetro). The procuracy noted that Nghia admitted to receiving a total of over 2.1 billion VND (90,700 USD) in extra-interest that was not stated in Vietsovpetro’s deposit contracts at the Ocean Commercial Joint Stock Bank (OceanBank). The money had been given to him by then General Director of OceanBank Nguyen Minh Thu on three occassions. Meanwhile, Huy said he had received over 4.1 billion VND in extra-interest in five installments. However, the procuracy argued that based on the investigation’s findings, there is sufficient basis proving that the actual money he had received from Thu was 7.9 billion VND. Vietsovpetro’s contracts with OceanBank were in line with the direction of the Vietnam National Oil and Gas Group (PetroVietnam) – which represents the Vietnamese Government in contributing 51 percent (or 765 million USD) of Vietsovpetro’s charter capital – regarding prioritising financial services of OceanBank, to which PetroVietnam contributed 20 percent of the charter capital. The receiving of extra-interest had negatively affected political security and social order, stirred public concerns, and undermined people’s trust in the Party and the State, the procuracy noted, adding that the trial showed the resolve to fight crimes, especially economic crime and corruption.